The liver plays a key role in neutralizing harmful substances in the human body, secretes bile, necessary for normal digestion, but also synthesize a number of biologically active substances that promote good health and support energy balance of all organs and tissues. For a reliable diagnosis of the liver, the doctor prescribes ultrasound, which can provide reliable information to detect any changes and to make an accurate diagnosis. Ultrasound is safe, inexpensive and effective method of examination of all internal organs. If you are concerned about the heaviness in the right hypochondrium, bitter taste in the mouth, nausea, poor digestion, heartburn, there are problems with defecation, you are experiencing weakness, General malaise, temperature changes, refer to a gastroenterologist-hepatologist. You draw the line on ultrasound examination of abdominal cavity and, if necessary, prescribe other types of surveys. In urgent cases, ultrasound is performed without preparation. But to get the most accurate results, the survey must be carefully prepared, to the gastrointestinal tract were as free from food and especially from gases that interfere with a reliable diagnosis of the liver and gastrointestinal tract. This is especially true of obese patients in whom the abdomen is draped in a large fat layer. A week before the test will exclude from a diet of vegetables, fruits, alcoholic and carbonated beverages, bakery products and legumes. Eat fractional, the most sparing diet is an easy porridge on water without salt and sugar. Take drugs that remove gases from the gastrointestinal tract, "Espumizan", "Pancreatin" or any other physician's recommendation. Three days before the ultrasound do the enema with the help of these "douches". Ultrasound should be done strictly on an empty stomach. Before the examination can not even drink water. The test you will make several projections on the back and on the left or right side, sitting, standing. 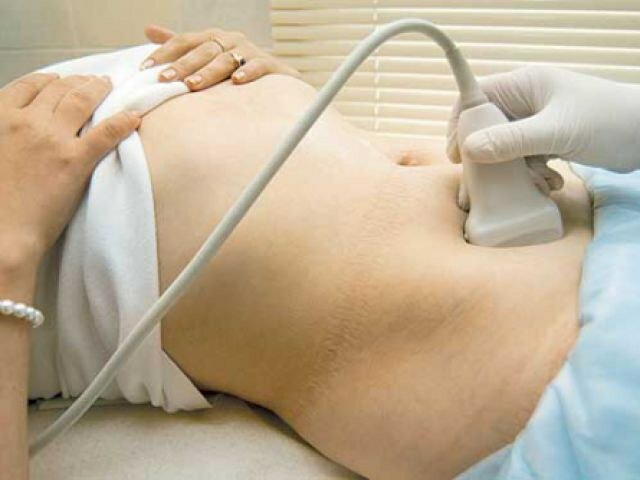 Diagnosis using ultrasonic examination allows to detect any growths in the liver and gall bladder, the presence of trauma, abscess, presence of parasites, lesions, cirrhosis, diagnose the syndrome of Budd-Chiari when there is obstruction of venous outflow, hypertension, to check blood vessels, ducts and measure the lobe of the liver. If the liver is not affected, the right its share is up to 12.5 cm, left in the anteroposterior size is 7 cm to 8 mm duct, portal vein up to 13 cm, the edge is smooth, homogeneous structure.